Yes. I, Thomas King, did contribute to the KickStarter to help raise the funds to make this game. This means that a lovely new Megadrive cartridge will be added to my games collection. Yes. TigerTails Gaming (everyone other than Xavier) was involved in the Closed Beta of the game, and have played it to completion before release. We also helped find some bugs which have been patched out. And yes, there is gameplay footage of us playing the beta versions, and no that will not be released. Nor will any ROM files, so don’t even bother asking. With the formalities out of the way, let’s get on with the review… Well, not such much review as a stream of consciousness, with a review flavouring. Tanglewood is a brand new game for the Sega Megadrive (or Genesis, if you’re from the USA) with ports to PC, Mac, and Linux via Steam, and a Dreamcast version coming in due course (thank you KickStarter stretch goals). The game was released on August 14 2018 and is made by Big Evil Corp – certainly not affiliated in any way with Sega. The game was written in 68000 Assembly and was made using Sega’s original hardware tools. Quite an achievement. We have talked about the game a couple of times before, but now we can talk about the whole thing! Well, we can, but this is going to be mostly spoiler free. There are some parts of the game that are best experienced for yourself. Nymn battles against the weather as well as the terrors of the night in Chapter 2: Storm Warning. 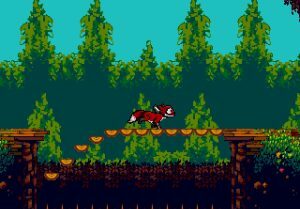 For those who have not read the previous writeups about the game, Tanglewood is a puzzle platformer in the same vein as Another World or Flashback, with design elements from games The Lion King and Sonic the Hedgehog sprinkled in to complete the package. You control Nymn, a fox-like youngling of the Djinn race. Lost and alone in the forest, it’s up to you (the player) to guide Nymn to safety. While by day the forest (and other environments you’ll traverse) seems relatively peaceful, at night time the ‘orrible things come out to play. With poor Nymn being their preferred plaything… or snack – Djinn are most certainly not top of the food chain. While out dodging foes and solving puzzles, you’ll come across some friends who can help Nymn along the way. The most common are Fuzzls. Cute little balls of fluff who, in return for you helping them to their nest, can grant special abilities. They can give the gift of flight (well, glide), taming some of the night dwellers for a short time, powering machinery, and even slowing down time. They’re quite powerful little beggars really. Which makes escorting them home for the night really worthwhile. Indeed, a lot of the puzzles are based around pushing Fuzzls into their nests, and then mastering the skill gifted to you. Things start off nice and easy. You see a nest and shortly afterwards you see a Fuzzl. Insert rod A into slot B and boom, you get the skill of flight that allows you to make a jump and continue on. Later puzzles, however, can be quite fiendish – though never so complex that you feel lost. Running across collapsing bridges in Chapter 3: Heritage. The foes that Nymn will have to face are wide and varied. From the huge and fast beast known as a Djakk, to the small and harmless looking Scirus. Each creature will have a way of defeating or avoiding them, and not all of them are solely denizens of the night. However, there is one enemy that you get introduced to in the opening cutscene that is different from all the others. What is it? Why does it look like some kind of demonic form? Why does it stalk Nymn while he sleeps? Who knows? The game itself if broken up into 8 chapters, each with multiple acts. As you progress through the acts the time of day shifts from the daytime to the nighttime – and the game gets progressively harder with each chapter. That said, the game never becomes frustrating. There are certainly sections of the game which require a degree of trial and error, and there are sections of the game that will require some skill in order to overcome the obstacles, but the game is never unfair with its challenge. Some of this challenge comes from the puzzles, some from the enemy encounters, and some from the level design. There are also some boss battle sprinkled in. Does the demonic force have something to do with that? With Nymn unable to attack directly, however, you’ll need to use your wits and cunning to take down your opponents. Fireflies and Fuzzls in Chapter 5: Bygone Mines. Being a puzzle platformer means that aside from tackling the puzzles and outsmarting the creatures you encounter, you’ll have another task to complete. Collectibles hunting. In this game the collectibles take the form of fireflies. There are 8 of them scattered throughout each act they appear in (not all acts have them), giving 168 in total. Some are placed as a guide to aid you through the levels, especially in the earlier acts, and some of them require some thought and skill to collect. Collecting them all will give you a very special reward, which will not be spoiled here. Pressing Start will take you to a pause screen where you can see the number of fireflies collected so far, plus a level code so you can come back to the game at a later date without having to play the whole thing through in one sitting. If you get close to the end of an act without collecting all the fireflies, just hold A+B+C in the pause screen and press Start again to be taken back to the main menu to enter your level code and try again. Graphically the game is wonderful to look at, especially in motion. The characters all move with grace and fluidity and the love really does shine through. This has been consistent from the first publicly released demo and is something I appreciate in a game. I can forgive many things, but shonky character animation is not one of them. The backgrounds are also rich and lush, for a Megadrive game, and the switches from day to dusk and then to night are a nice touch. Each stage takes place in a different environment, starting out in lush green forests, finding evidence of civilization, underground caves, and the desert. Not necessarily in that order. 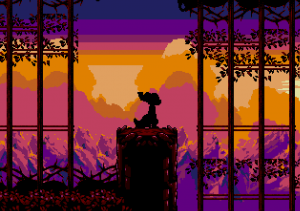 There are times when the backgrounds can seem a bit sparse, but this appears to be a deliberate design choice and they do well in setting the scene, hiding fireflies, and providing the setting for some of the puzzles the game presents. This is especially apparent during a level that takes place in a lighting storm, where the sparseness is actually part of the challenge itself. Creative uses of lighting in Chapter 6: Deadwood. Keeping consistent with games like Another World, Tanglewood has no lives system. Instead there are checkpoints at key points in each level which you restart from upon death. This makes the trial and error element of the game far more palatable. In this modern age, games that have lives are often frowned upon. The mechanic is a throwback from the arcade era, and can serve as a method to increase the longevity of a game if done correctly – but if done incorrectly it can be an irritating roadblock in the completion of the story. Tanglewood sidesteps this by allowing infinite deaths. This does make the game a fair bit easier but also considerably more fair. The environments are dangerous and death can come at any time, especially for a casual gamer. That said, even the least experienced of player should be able to get through the whole thing in around 5 or 6 hours with a little patience. If even I was able to beat this game anyone can. Something else that’s worth mentioning is the music. Created by experimental digital artist Freezedream, the original score to this game ranges from light and calming to dark and atmospheric. The music isn’t a constant soundtrack like in Sonic, but rather it kicks in to deepen a scene before slinking off when its job is done. Starting with fun, gentle melodies in the downtime, it doesn’t shy away from ramping up to percussion heavy, adrenaline pumping action music when Nymn’s life is being directly threatened by the terrors of the night. The sound is driven by the Echo sound engine, created by Sik, and really allows Freezedream’s compositions to shine in a way that other engines may not have… Sonic Spinball’s sound engine, I’m looking at you here. Nymn glides with a Fuzzl powerup in Chapter 1: Harlequin. Of course, no game is perfect. There are some minor gripes that come with the game. Most notably the controls. For the most part Nymn responds to button inputs rather well, however the platforming isn’t as tight as other games in the genre. Some of the deaths I encountered were from being unable to jump when I wanted while being chased. While this never became frustrating and jumping a few frames earlier worked, I did feel like a couple of deaths weren’t my fault. At first I had this attributed to my aging Megadrive joypads, but since playing the Steam version on my keyboard and experiencing the same issues I can only conclude it’s how the game’s controls work. This is only a minor issue though, as the controls are far from sloppy (this ain’t no Busby, for sure) and dropped inputs only appear occasionally so are only ever a fleeting annoyance. Also some of the colours used to portray the sky during some acts can also be a little bold. While I personally had no issues with them, I can see how they may not be to everyone’s taste. 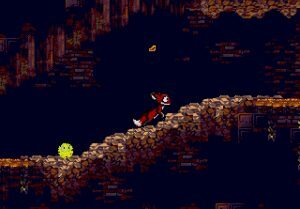 It can make the fireflies a little trickier to spot, so a keen eye is required for doing a 100% run. Overall, though, Tanglewood is a fantastic game. It’s coming out at a time when retro is current again, and the march of the mascot platformer is on the rise. However, while most of the games looking to cash in on our nostalgia are inspired from the retro eras, Tanglewood goes that extra step by actually being a modern retro game. The aesthetics and mechanics aren’t trying to emulate the feeling of a bygone time, they’re actually working within the confines of the hardware and Big Evil Corp are using that limitation to drive creativity in both design and execution. This isn’t a throwback to the past, it’s a continuation of the genre. Taking what the industry has learned over the past 20 years and applying it where required so we can see what games can be like on the aging 4th generation systems with the benefit of hindsight behind us. Tanglewood is a modern game, made for an old system, using ancient tools and methods – and if that’s not something worth celebrating, I don’t know what is. 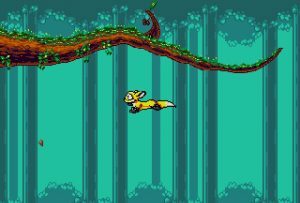 Website: http://tanglewoodgame.com – Sega versions. 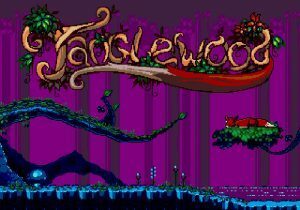 Steam: https://store.steampowered.com/app/837190/TANGLEWOOD – Windows, Mac, Linux, and Steam OS versions. 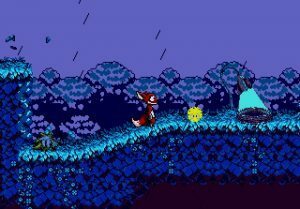 Itch.io: https://bigevilcorporation.itch.io/tanglewood – Windows, Mac, and Linux versions. It was so fun reading the thoughts from someone else who was lucky enough to get early access to Tanglewood. I share many of the same impressions as you. In particular the use of Music in Tanglewood is soooo well done. This game has a real tangible mood. It’s fantastic. The only point I differ on is that I felt the controls were spot on perfect. I played mostly on my Genesis console and I felt totally in control of Nymn. But regardless, it’s wonderful to read impressions from other people. I’ve been starved for Tanglewood content and your review really hit the spot. Thank you. I wanted to get all my thoughts about the game out before I get Xavier to complete it for the videos. Hopefully it wasn’t too rambling and I’m glad you had fun reading the wall of text. It was certainly great fun to write. And certainly the longest post on this site too. And now to plan the videos! Hope to see some on your channel too.